Organ Supply Industries, of Erie, PA, produced this small hand-cranked 20 note organ. "Strasse Orgel" is German for "street organ." OSI also referred to them as "Strassen Orgel" in some documents. Most of these organs were sold as part of the cart for Hurdy-Gurdy Italian Ice franchises. Only a small number of the Strasse Orgels were sold directly to the public by OSI. Two groups of organs were sold as part of the franchise, about 60 Hofbauer 20 note Mikro organs and about the same number of organs produced by OSI. The franchise organs will have the words "Hurdy-Gurdy" on their faces, as will a few of the privately sold ones. The owners of these organs have only recently gained access to the real history of the OSI Strasse Orgel and the "Hurdy-Gurdy" Hofbauers. Click here to learn the secrets! The OSI Strasse Orgel is no longer available for sale by OSI. These web pages are being developed as a place where owners and or fans of these machines can exchange information, and as a way to provide some contacts between owners. Include your Name, and Address, (and email address or website if you have them). If you own an Strasse Orgel, please tell me the name (if any) you have given the organ and the Serial Number. By joining the OSI Strasse Orgel Owners' Group you give me permission to provide your information to other group members. Bill Klinger, a piano and organ technician in Arkansas, has been working on a new electronic interface for the Strasse Orgel. The Combo ReadeR interface reads music from SD memory cards, as used in many cameras, and music is stored in standard Type 0 MIDI format. It incorporates a MIDI output driver board as well as a ReadeR card reader. The unit is a straight "plug-in" for the original connector in the OSI organ, so not expertise is needed for installation. This allows us to edit our own music files and greatly expand of music libraries. The details are still evolving, but Bill has produced three prototype units, and they work very well. The original OSI music files have been converted to standard MIDI files and will be made available to OSI organ owners. A collection of over 50 additional tunes converted from Wurlitzer roll scans is also available on this website. Click here for information on those files and a link which allows you to download the collection at no charge. Bill now has a website with some details on the Combo ReadeR at http://klingerorgan.com and can be contacted at info@klingerorgan.com or by phone at (870) 453-7503. The ReadeR (without driver board) as a separate unit is sold through http://www.aturnntime.com and shown under the Topsy tab. It is capable of sending the full 16 channels and 128 notes of General MIDI. 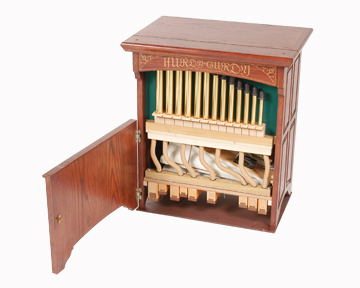 The OSI Street Organs are tuned to the Carl Frei 20 note (German 20er) scale. This scale is used on many small modern crank organs, so it is also known as the "Standard 20 Note Scale," the "Raffin 20" scale and the "Smith Busker Organ" scale. There are other 20 note organ scales in use, particularly on older barrel organs such as the Gem Roller Organs. You will note that there a lot of "missing notes." B, C#, F# and G# do not occur in the scale at all. The OSI Street Organs are available in two case styles: A "Plain Case" design which lends itself as an ideal platform for custom inlaid woodwork, paintings, decals, etc., and a "Traditional Panel" Street Organ which offered a "Classic" look with routered inlaid panels on all four sides. Each case style was available in various hardwoods and finishes, including custom finishes. The Melody flute pipes are made of solid brass and are polished to a brilliant finish. This organ was designed to be "user-friendly." To operate the organ, simply rotate the crank arm located at the rear of the case, fast or slow, in either direction. No more paper music rolls to rewind or wrinkle. Music was available on a plug-in type music card, from which musical selections can be picked at random or in sequence. Tempo is adjusted by a rotary dial. Turning the ergonomically correct hand crank drives a double wedge bellows and reservoir. This supplies wind through the electro-mechanical chest and into the 22 individually hand-crafted wood bass pipes and solid brass melody pipes. Each set of pipes is individually voiced for a full, rich sound. OSI engineers have developed a music reading system to replace the old and clumsy perforated music rolls. Rather than encoding the music on rolls, it was encode it on a credit card-sized, plug-in memory module. Each module is capable of holding 100 songs, of which 25 are included at no charge with the purchase of a Street Organ. Expanding the musical library was possible with additional selections was possible with the purchase of additional cards. Included with each Street Organ was a 12 volt DC rechargeable battery and charger, which supplies continuous power to the electronics module for many hours of enjoyment. OSI will not provide support for these small organs. I have compiled spreadsheets of song lists for the three OSI Music Cards which we own. These are provided here in HTML format.. Please send me additional information or corrections.